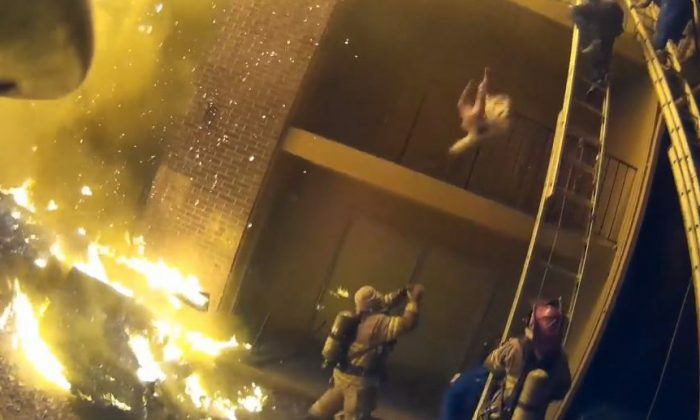 The dramatic moment when a Georgia toddler was thrown from a burning building into the arms of a firefighter was captured on camera. The moment came as firefighters worked to rescue a family of eight children trapped in a burning apartment building in Decatur. Fire Captain Jackie Peckrul caught the four-week-old boy who was tossed from the balcony. “The original plan was to get up on the balcony with them to assist them on the ladder and have somebody else bring them down. I got about halfway up and I look up and somebody was dropping a baby to me,” she recalled to Inside Edition. A number of people in the apartment complex were forced to jump from their balconies while others were able to run outside to avoid the flames, a witness told WSB-TV. “Jumping out of the building. Jumping out of their balconies. Someone said they threw their baby outside and fireman caught the baby,” the witness said. Tierra Pyle, one of the displaced residents, told the Atlanta Journal-Constitution that she was getting ready for work when she heard a noise. After firefighters started banging on doors, she exited the building. Investigators are still trying to pinpoint how the fire started. In total, 12 people were injured and around 50 people were displaced.